The Minister of Water and Environmental Affairs Mrs BEE Molewa, MP, has declared the Prince Edward Islands, a Marine Protected Area (MPA). The new Prince Edward Islands MPA, the first South African offshore MPA, will serve to significantly contribute to global initiatives towards protection of offshore and deep ocean areas. The declaration is in line with South Africa's new "National Protected Areas Expansion Strategy" which seeks to structure the way in which protected areas are declared in order to maximise conservation benefits. This strategy drew attention to South Africa's lack of offshore protected areas, and put forward the Prince Edward Islands. "The Prince Edward Islands MPA is a significant contribution to the conservation of global biodiversity. The new MPA will also contribute significantly towards South Africa's national and international commitments to biodiversity protection," said Minister Molewa. Minister Molewa also added that, "the new MPA is intended, among other things, to contribute to the protection of unique species, habitats and ecosystem processes. It will also provide scientific reference points that can inform the future management of the area and to be able to understand better the impacts of climate change on the whole Southern Ocean. It will also contribute to integrated and ecologically sustainable management of marine resources of the area." The marine biodiversity of the Prince Edward Islands is of global importance. Given the scarcity of land masses in the Southern Ocean, sub-Antarctic islands contain vast populations of seals and seabirds, which use these islands to breed and moult. This means that these islands are critical to the conservation of such species as they are forced to aggregate in high densities where they are vulnerable to disturbance and the threat of introduced predators or pathogens. The Prince Edward Islands Marine Protected Area is a proposed MPA located almost 2,000 km southeast of South Africa in the Indian Ocean. In 2009 the South African government declared its intent to establish this MPA to protect the Exclusive Economic Zone around the islands, which provides habitat for seals, killer whales, breeding seabirds, and several other marine species. Biodiversity in this region has been adversely impacted by overfishing of Patagonian toothfish by IUU vessels and incidental bycatch of seabirds from longline fishing vessels. When established, the Prince Edward Islands MPA will create four no-take IUCN 1a Strict Nature Reserve areas and continue the fishing closure that exists within 22.2 km (12 nm territorial sea) of shore. 2014. Blog post about "Using fur seals to map Marine Protected Areas." 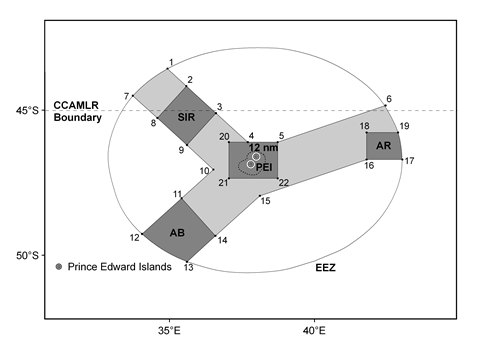 Study on Marion Island within the Prince Edward Islands MPA. fishing info: No fishing allowed without permitted. Toothfish fishing capped by effort. No bottom-trawling or gill-netting allowed. Permitted vessels must carry observer.